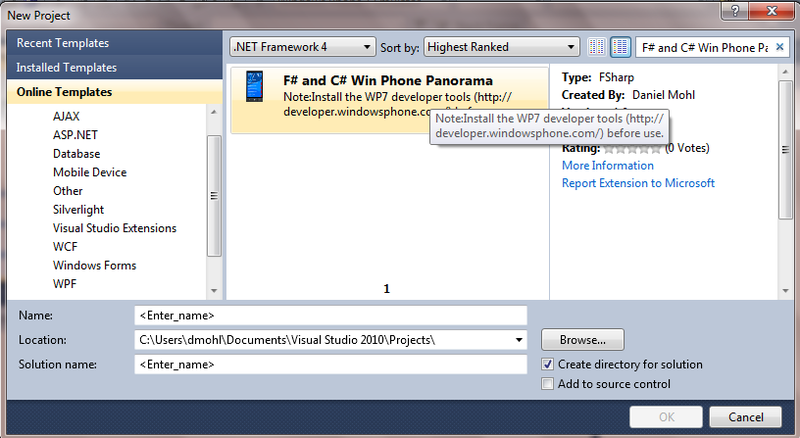 In my last post, I announced a F# and C# WP7 Panorama with Caliburn.Micro template. That template generated some interest in having a similar C# only template. You can find the C# only version on Visual Studio Gallery or through the Online Templates feature of Visual Studio 2010. 1. 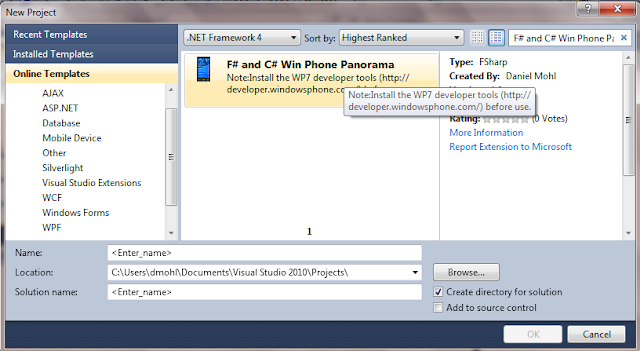 Download and install the RTW release of the Windows Phone Developer Tools. 2. In Visual Studio 2010, navigate to File -> New and select Online Templates. The full source is available at http://github.com/dmohl/CSharpWP7PanoramaWithCaliburnMicro. the new WP7 panorama C# template that was included in the RTW release of the Windows Phone Developer Tools, I found a good opportunity. For those who haven't heard, Caliburn.Micro is a lightweight, feature packed MVVM framework. Rob Eisenberg (@eisenbergeffect) has done a fantastic job in developing this framework which consists of a "~50k assembly that builds for WP7, SL4, and WPF4" (Caliburn.Micro Introduced). While the assembly is small, the feature set is impressively large. Features include: ActionMessages, action and binding conventions, event aggregator, view locator, bootstrapper, logging, and much more. There are also a handful of features specific to WP7, not the least of which is the handling of tombstoning. To put it simply, Caliburn.Micro helps you code the "right way" while making everything easier along the way. You can find the new F# WP7 Panorama template on Visual Studio Gallery or through the Online Templates feature of Visual Studio 2010. As with all of the templates that have been announced on this blog, you can find the full source on github. The two F# Windows Phone 7 templates (F# and C# Win Phone App (Silverlight) and F# and C# Win Phone List App(Silverlight)) have been updated to support Windows Phone Developer Tools RTW. I've been meaning to write this post for a few weeks now. With the announcement of the F# 2.0 standalone tools update for Visual Studio 2010 Shell, I have updated the pure-F# templates to support the IntegratedShell SKU. This includes templates F# Windows App (WPF, MVVM) and F# Web Application (Silverlight). Note: The F# Web Application template includes a C# application for the purpose of providing a hosting example. This C# hosting application will not be created successfully when using only the F# 2.0 standalone tools with Visual Studio 2010 Shell. Since this is not essential for the development of the actual Silverlight application, I decided to include IntegratedShell SKU support for this template with this as a known limitation.